We have been the first in Poland to use such a complex Virtual Reality system, both in marketing and sales, for the real estate industry. VR technology, video 360, unique pre-sales concepts and new forms of online real estate marketing have resulted in extraordinary effectiveness and a huge ROI. We would like to present our case study of the “Komorowice” campaign, awarded Golden Arrow, a prestigious marketing award, as the biggest internet innovation of 2015. Watch our 2-minute video case study – make sure to turn on the subtitles. Our client was a real estate developer from Wroclaw – Domar Development, and the subject of the campaign was their new investment of “Komorowice III” terraced houses. The properties were located in Karwiany, one of the suburbs of Wroclaw. In stage I, the houses offered occupied plots ranging from 170 to 371 m². The main aim of the campaign was to sell Domar Development’s real estate as soon as possible, right from the very first weeks of the sales campaign, during the “hole in the ground” stage. The local campaign (Lower Silesia) was to reach a narrow target group interested in buying a house. Time shortage and limited media budget posed an additional challenge. The adCookie agency proposed a strategy that involved abandoning the traditional offline real estate marketing channels often used by developers (outdoor, radio, press, tv) and focusing on digital activities, new technologies and Virtual Reality. „When we were asked to prepare a campaign for Domar Development, we immediately thought of focusing on online activities because this way we would reach the potential customers much more precisely, and we could easily measure the results. In view of the limited media budget, we have completely abandoned traditional media (outdoor, radio, press, television). The idea for the pre-sales turned out to be a big success, and that made it possible for us to find buyers for several houses already in this initial phase – our first goal of the campaign. 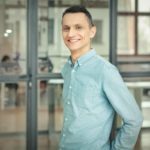 Eventually, in the pre-sale period, customers bought 3 times more property than the original objective assumed,” says Mateusz Sobieraj, CEO of adCookie. 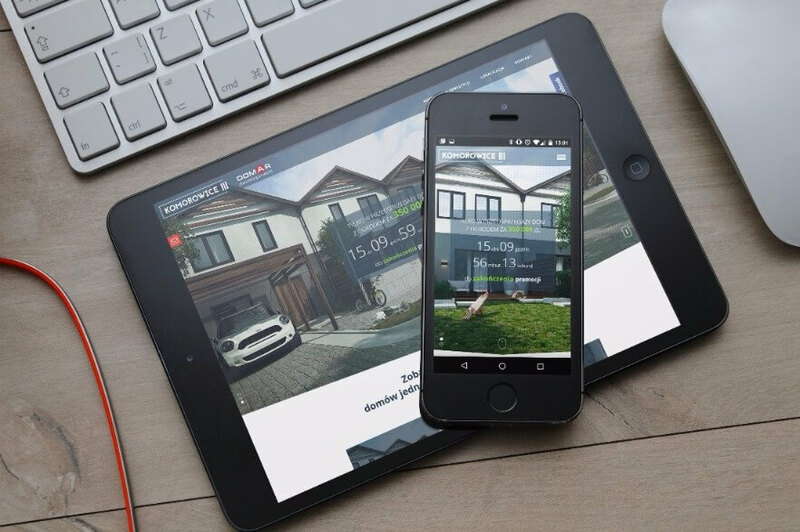 The strategy included using non-standard forms of digital promotion and implementing a comprehensive Virtual Reality system for the presentation and sale of properties. Komorowice “campaign was the first in Poland to be based on VR technology to such an extent, combined with innovative activities in the online channel. The pre-sales phase was supported by an intensive six-week online campaign, aimed at obtaining a large number of valuable leads, i. e. those interested in buying a home. Communication has been adjusted to customers both before and after the sale. Appropriate implementation of our activities allowed us to reach new customers, but also to continue dialogue with people who were interested in pre-sales. The wide range of tools available recently enabled us to create the first campaign on the Polish market, fully utilizing the potential of VR and video 360, which, together with digital activities and new forms of advertising, has generated great interest in the investment from the very beginning of marketing activities. Preparation of a strategic concept, implementation of a visual identification project for the investment. Creation of a dedicated, responsive website with a time counter measuring the time until pre-sales is completed and with a “MDM Calculator”, which calculates the maximum possible amount of MDM compensation for a given Client (MDM stands for Mieszkanie dla Młodych, or Flats for the Young, a Polish government-run program aimed at supporting home ownership). Implementation of analytical tools on the website, full configuration of Google Analytics, as well as tools for measuring the distribution of clicks, scrolling and general user behavior (heatmap, scrollmap, etc.). 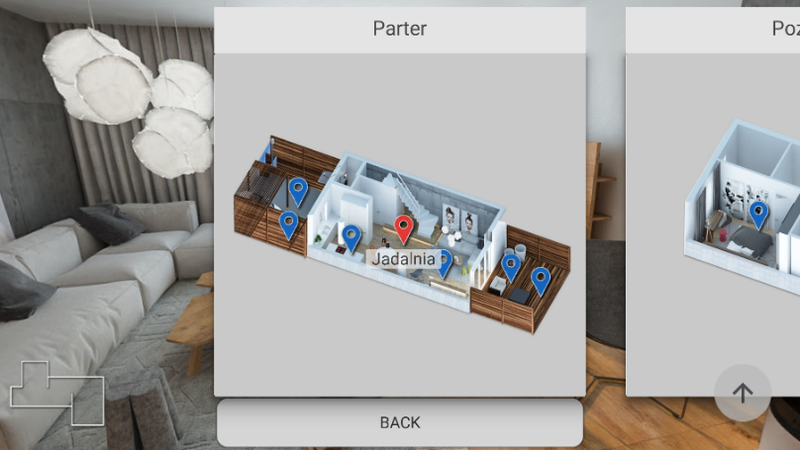 Implementation of a comprehensive Virtual Reality system, which included both VR content, developed on a world-unique software from VR Global, as well as a mobile application and a toolkit for the sales department. A virtual walk around the investment and a video 360 was also created. Implementation of an intensive digital campaign based on well-proven tools such as SEM, real estate portals, but above all on innovative online advertising capabilities: RTB, Audience Targeting, GSP (Gmail Sponsored Promotions), YouTube video 360, Facebook Lead Ads, Facebook Video 360, Retargeting. Ongoing analysis and optimization of the whole online campaign – modification of advertising forms, targeting models, rotation of the creatives, segmentation and budget allocation. The first demonstration of properties in VR during the “Night with design” event. The last, complementing element of the real estate marketing campaign was Domar Development’s participation in the “Night with Design” event and the real estate trade fair. It was during the event that its participants had an opportunity to learn about the developer’s offer within virtual reality. 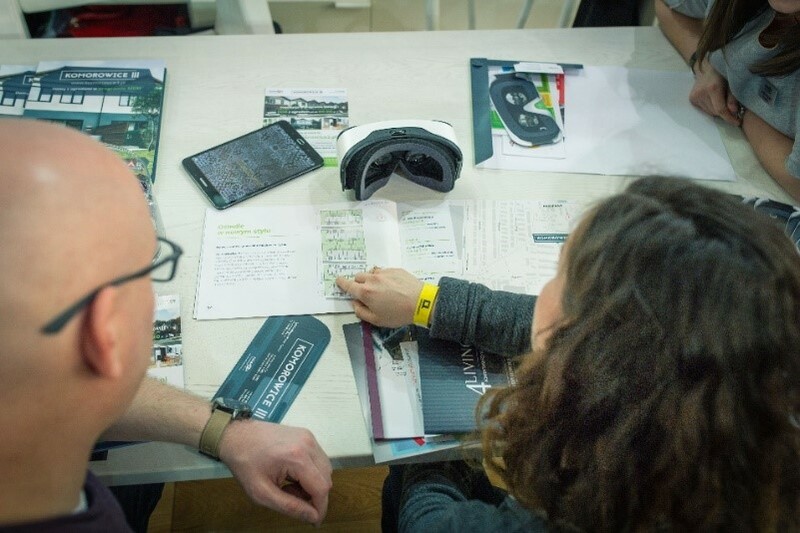 Thanks to VR, every visitor to the Domar’s stand was able to see the Komorowice estate and examine what the individual houses will look like even before they are built. This new technology perfectly visualized the unknown spaces, which gave potential future residents the impression that they knew them already. Both the stand and the presented offer were very popular among the visitors. “The main concern of people who buy real estate before it is built is whether a given house meets their expectations, their needs, and finally – whether they feel good in it. Virtual reality is an excellent answer to these doubts. It allows us to move to another world, to feel as if we really were in a new place. First of all, it gives you a chance of interaction with a place that does not (yet) exist in reality. The participants of the event could temporarily live in virtual houses and bond with them emotionally. The virtual reality creates completely new possibilities of presenting the offer of developers. From the very beginning we had no doubt that using VR in the campaign for Domar would be a hit “- adds Krzysztof Karmiński, Digital Media Manager adCookie. Developer’s participation in the event and the utilization of VR were both given adequate publicity beforehand. Promotion of the event was carried out on the website, in social media, YouTube, mailing and in sales materials. The results of the campaign significantly exceeded expectations of Domar Development and were much superior to the results of its previous real estate marketing activities. Within 6 months all houses from the first stage of the investment were sold, 50% of which found their buyers in the first two months. As a result, the developer decided to build the next stages earlier. The results of the online campaign itself were significantly higher than previous efforts in the developer’s real estate marketing, both in terms of cost, range and quality of traffic generated on the website, as well as the quality of provided leads, contacts with the sales office. expediting the construction of the following stages of the housing estate to fully utilize the potential of high interest of the buyers in the first period. The above case study proves that it is worth to go beyond running old patterns and to reach for modern forms of advertising. Even in a traditional industry like real estate. „The campaign brought better results than we initially assumed. All the activities formed a coherent whole, which translated into reaching people truly interested in terraced houses from Komorowice 3. Unconventional solutions that we used in the campaign In the case of the project (including VR technology), they were ideally suited to the target group, i.e. 25+ people who were looking for property under the MDM program. On the one hand, those solutions intrigued and effectively attracted attention, while on the other hand they allowed us to see the future house, which helped us make an important purchase decision,” says Jagoda Marszałek, Head of Domar Development’s Sales Department. Non-standard forms of promotion can work in practically any industry. They are based on solutions that can be very well matched to every company – its capabilities, potential specifics, hence their implementation in real estate marketing work like a charm. Unconventional campaigns allow you to stand out from other competing companies. They help your brand and your product be better remembered. This makes it much easier and more effective to reach a potential customer.